At age 6, Melissa came to live with her foster mother, a retired teacher, who held high educational expectations of her and believed that she would be successfully employed and contribute to society. During high school, Melissa participated in a transition program that included community employment experiences. When Melissa completed this program, she tried working at different jobs in the community. However, she had difficulty without the structure of the transition program, which had allowed her greater access to a job coach . Without this support, Melissa experienced barriers caused by the symptoms of FASD. She had difficulties with concentration and interpreting directions. Together, Melissa and her mother identified her strengths and the work environments that might be best for her. They felt that she would do much better in a job where she could have more coaching and concrete instructions. She also wanted to work with people and to continue to develop her communication skills. With all this in mind, they decided that Melissa's best option might be to create her own employment opportunity. They pursued a career that focused on one of her strong interests: dogs. Melissa's first dog-related job involved starting a dog-walking service with a friend. She enjoyed doing this and decided to make home-baked dog treats for her customers for Christmas. The treats were a hit with the dogs, and customers began asking if she sold them. This gave Melissa the idea to start Lissie's Luv Yums. Melissa and her mother discussed the idea of working for herself and what she would need to start a business. They contacted Roger Shelley, an administrator at the Montana Rural Institute, who, through the Montana Jobs Training Partnership Act, helped them apply for a grant to support self-employment for people with disabilities. They used the grant money to buy shelving, equipment, ingredients, and packaging supplies. Staff from the Department of Vocational Rehabilitation also provided some skills training and advice on developing a small business. From there, Melissa and her mother developed the dog-biscuit business around her strengths and support needs. Melissa has run Lissie's Luv Yums out of her home for eleven years and works with her mother and another employee. 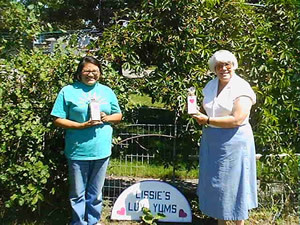 They sell the dog treats to local customers and at trade shows, and through their website: www.lissiesluvyums.com. Over time, Melissa has become involved in every aspect of the business, from mixing biscuit dough to handling customers' orders and preparing tax returns. Her mother is her main support, helping break tasks down into small steps and written lists so Melissa can learn them correctly one step at a time. Melissa and her mother also want the work they do to educate people about fetal alcohol spectrum disorder (FASD). Melissa offers a franchise opportunity with Lissie's Luv Yums for others with disabilities, and encourages those with FASD to apply. She also shares her knowledge and experience with FASD and advice on successful self-employment with the Montana Rural Institute and the Developmental Disabilities Council. She participates on an expert panel for the Substance Abuse and Mental Health Services Administration that helps Native American people coordinate substance-abuse prevention programs. Melissa gave a presentation on FASD to her own people, the Gros Ventre Assiniboine, and earned the name Eya Be Washday Weya (“Good Words Woman”). Family expectations about the importance of education and work set the foundation for success. When traditional supports are not working, think creatively to identify opportunities that will lead to a better job match . The right funding and support to start a business can come from more than one source. Melissa and her mother accessed all the resources they needed to give the business a strong start. Successful entrepreneurs with disabilities can be resources to the service system. When other job seekers ask for employment options and ideas, employment professionals can present the experiences of these entrepreneurs.